For non-programmers and those who just want a 'quick and dirty' fix, the copy-and-paste method is ideal. As its name suggests, it essentially consists of copying and pasting code that you obtain by searching the internet and just using it as is. While it is relatively fast and convenient, the downside to this method is that you may find that you have issues that you're unable to deal with, and you could end up tying yourself in knots trying to get code that you don't understand to work. If you do choose to learn using video tutorials, it would be a good idea to be able to save them so that you can watch them at your leisure. 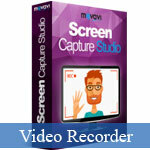 Give the Movavi Screen Capture Studio a try and you should be able to record any online video tutorials with ease. Using the features of the Movavi Screen Capture Studio as a streaming video recorder is easy - just position the recording area to encompass the video that you want to record, and start the process. When it's done you can save and optimize the video with the help of the presets that are available. Before you do so however, you could also explore the other features of the Movavi Screen Capture Studio to edit and improve your video in various ways. It will let you cut and combine video segments, enhance the video quality, insert customizable text, add background music, utilize special effects, and much more. Essentially you will have all the flexibility in the world, and you could even save the important bits from several video tutorials that you need in a format that is ideal for mobile devices, and then upload them to your tablet or smartphone so that you can refer to them whenever and wherever you may be.